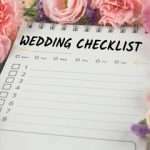 Wedding planning checklists are essential when organising your wedding – and to keep you calm! Wedding planning checklists should cover everything to do with your wedding day, from engagement right through to the day itself – and beyond. So, what should Wedding planning checklists include? This is the first thing that should be ticked off. Until you do this you can’t choose your Venue, what sort of wedding you can have, how many Guests you can invite plus much more. In fact, without a budget in place, you’re not able to plan a wedding! Once you have decided on a budget, you then need to work out how many Guests you want to invite. Start to draw up a Guest list. There is no point in looking at Venues before you do this. You may be looking at places that are too small to accommodate the number of Guests that you want to invite. Wedding planning checklists can also give you an idea of when things should be done by. Remember, LMS Weddings can help you with everything from helping you to source a Venue or suppliers. I can also be there on the day to ensure you can enjoy every moment of your wedding stress free. I can also help you build up timelines of how you want to schedule your big day.